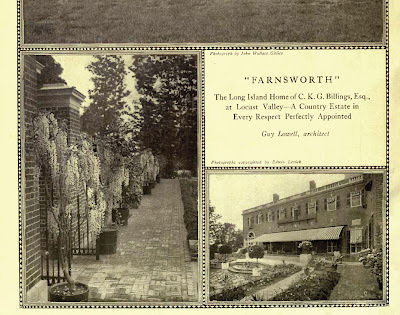 Pictures of 'Farnsworth', the C.K.G. Billings estate designed by Guy Lowell c. 1914 in Matinecock from House & Garden magazine, courtesy of a blog I recommend everyone check out, The Down East Dilettante. Click HERE for more on 'Farnsworth'. If memory serves me correctly then i think that room is in a book under the name the W.C.bird estate. Is that right? Yes, Bird was the second owner of the estate. And the story of the fate of the Bird mansion is famous: Wallis Clinton Bird was killed in a private plane crash in June, 1940 flying from Roosevelt Field to the Thousand Islands. His widow Marjorie Winifred Bird was, by many accounts, deranged by the whole buisness and became a virtual recluse. She eventually closed the house and moved to Paris. She is alleged to have been murdered by her doctor in Lausane, Switzerland in July, 1961 through a drug overdose. Farnsworth was then virtually intact, with the garages filled with the most amazing cars and the house much as it was the day Bird died, although the property became terribly overgrown. Subsequent to her death, the cars were sold, the house's contents dispersed and the place fell into ruin, the most famous "haunted house" in the neighborhood. I went to the sale w/my dad. The inside of the house was quite vandalized, supposedly by local college kids. I believe Paul Kollsman, the genius - inventor, purchased the Bird Estate in 1946 and it sold in or about 1970. 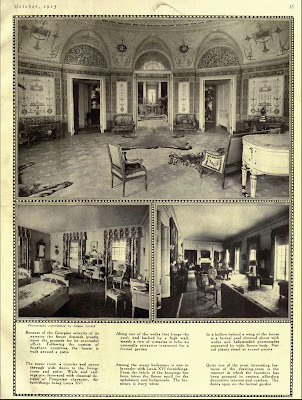 Apparently, Kollsman occupied only two of the several guest houses and never opened up the main house during his reclusive owner ship. Near by was one of his Kollsman Instruments laboratory. Kollsman also purchased, in 1945, the Frances Merion 1923 built Wallace Neff design Enchanted 'Happy Hill' magnificent 24 acre estate which was sold to Paul Allen in 1997 along with the addition 100 acres Kollsman had acquired for a 75 home residential land development by 1977. The permit was granted, in 1984, two years after his premature death in 1982, and after a five year unnecessary court delay. Lonely Bachelor Paul Allen torn down the Gracious 10,000sq ft and maintenance needing 75 year old estate and had the 4-lane private 1/2 mile road access built...awaiting...still in 2014... two 50,000 sq ft "insulting gross obstacles" proposals for building plans atop the highest Beverly Hill hilltop.